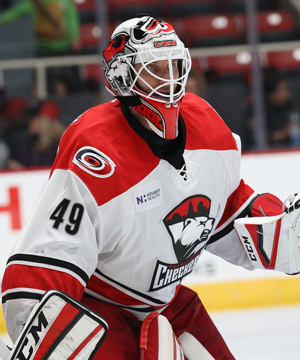 The AHL’s all-time shutouts leader struck again Saturday night, blanking the Grand Rapids Griffins 3-0 to clinch a weekend sweep by the Checkers. Charlotte flipped the script from last night’s come from behind victory, banking two goals quickly in regulation. First was Valentin Zykov chipping in a rebound out front on the man advantage, followed shortly by the captain Derek Ryan deflecting a shot through traffic and in to give the home squad a 2-0 lead. That two-goal advantage would prove to be enough. The Griffins mounted several rally attempts, including one on a power play late in regulation, but couldn’t find a way through the Checkers’ stifling defensive play. Facing an extra Grand Rapids attacker, Charlotte would find the back of the net one more time, with Ryan busting his way down the ice for an empty-net tally that sealed the 3-0 victory. The star of the night was Leighton, who notched his 47th career shutout by turning aside all 30 shots the Griffins sent his way. Leighton’s strong play seemed to emanate out from the crease, with the entire team playing aggressive and active defense on a formidable Griffins attack. While the goaltending took the headlines, the Checkers top offensive trio of Ryan, Zykov and Brock McGinn played a key part in getting the Checkers an early lead they could run with. Ryan has continued his scorching start to the season, bringing his point total to 10 through the first 6 games. He’s been a driving force behind his line’s early success. Picking up two wins in front of an energetic home crowd is a big boost for a team that struggled with some consistency to start the year. With their first win streak under their belts, the Checkers head into their shortest break of the season thus far, hosting the Rockford IceHogs on Wednesday and Thursday. Even with the four points in the standings from the weekend, there’s still plenty of work ahead. Leighton’s shutout was just the second shutout by a Checkers goalie since April of 2014 … This marked the first time the Checkers have won consecutive games this season. They have now won each of their first two home games after starting the season 1-3-0 on the road … Ryan finished the game tied for second among all AHL players. He has three multi-point games and has been held off the score sheet only once … This was Ryan’s third multi-goal game in his two AHL seasons … Zykov (1g, 1a) recorded his first multi-point game as a Checker … Grand Rapids entered this two-game series with a 4-1-0 record ... Forwards Kyle Hagel, Mitchell Heard and Erik Karlsson and defensemen Dennis Robertson and Josh Wesley were healthy extras.